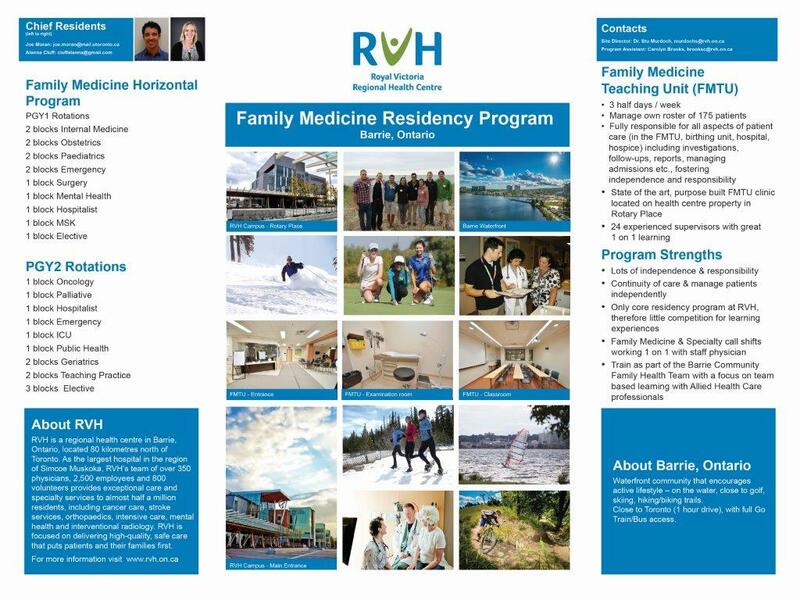 In July 2009, Royal Victoria Regional Health Centre became the site of a “Family Medicine Teaching Unit” (FMTU). The FMTU is a partnership between Royal Victoria Regional Health Centre, the University of Toronto Department of Family and Community Medicine, and the Barrie Community Family Health Team (BCFHT). First and second year medical resident physicians, specializing in family medicine, will receive their final medical training in a hospital and community environment. At the FMTU residents manage their own practice of up to 175 patients. The FMTU is located in a 12,000 square foot state-of-the-art space fully equipped with, a procedure room, a dedicated classroom, 4 call rooms and a large resident lounge. Residents and their roster of patients are part of the FMTU, which is a member of the BCFHT. The BCFHT is one of the largest in the province, and offers a multidisciplinary team approach to patient care. To date, there have been 37 residents complete their two-year training program. 23 of them have stayed in the area working in a practice setting, as a hospitalist and in Emergency Department. In addition to the two-year family medicine residency program, RVH is also a teaching site for U of T Radiation Oncology core rotations. The combination of teaching unit, hospital rotations and other community placements offers an excellent mix of in-patient and outpatient experiences to maximize the resident’s training. Due to the limited number of specialty residents and undergraduates, our Family Medicine residents will enjoy the benefits of functioning as primary house staff and the hands-on learning opportunities this offers. Instruction is provided by teachers with vast experience in core rotation and Family Medicine training. Highly skilled and enthusiastic sub-specialty instructors, working directly with residents, will provide a broad, comprehensive and rewarding experience. These learning interactions create mentor-student relationships that foster confidence and competency in patient and practice management. Learning is enhanced by call requirements with specialty faculty. Call on most rotations ends at midnight, with the exception of 24 hour call while on Obstetrics rotation. "Choosing a residency program was hard! I had about 40 different programs from all over Canada on my rank list. 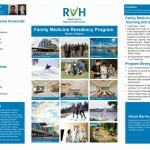 The family medicine teaching unit at Royal Victoria Regional Health Centre in Barrie was my first choice. In terms of the program, the FMTU allows you to see your own practice of patients. This responsibility really solidifies learning. Also, because we are the only residents on site we are usually first assist in the OR, and get called into interesting cases routinely in the emergency room. As a city, Barrie has access to all kinds of amenities, including a beautiful lake and is only minutes from cottage country. At the end of my two years I will be ready for full-service rural family medicine!" "I have been working at RVH and the Family Medicine Teaching Unit for just over a year now and I have nothing but great things to say about. The staff in both the FMTU and RVH is extremely friendly and they made me feel welcome and right at home from the beginning. The Teaching Unit is a beautiful facility with huge windows, spacious exam rooms and all of the needed medical supplies and more. I feel very lucky to have had the opportunity to complete my residency in Barrie and I am hoping that I will be able to continue to practice in the area in the future"
Still have questions unanswered? View the F.A.Q. page.